Strawberries and rhubarb are both free of detectable FODMAPs is appropriate serving sizes! I don’t know about you, but I find that pretty exciting. I love food, I love fruit and I love dessert – so I knew that I wanted to bring you a bunch of recipes featuring this fabulous pairing. 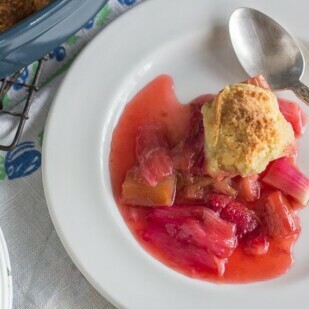 This Strawberry Rhubarb Cobbler is very easy, low on sugar (for a rhubarb recipe) and the biscuits have a little bit of cornmeal added, making them filled with grainy goodness. 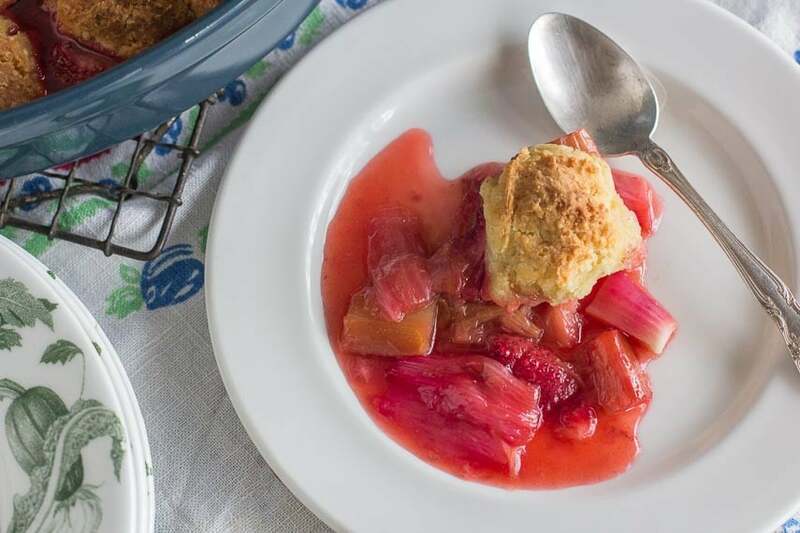 Read more about rhubarb itself, check out our Ingredients column. And for other delectable rhubarb recipes, check out our upside down cake, tart, pie and we even have a Rhubarb BBQ Sauce! The fruit can be mixed right in the baking dish. Then, the biscuits can be made by hand and dolloped right on top of the fruit mixture. They are a “drop” biscuit, which means just that – you drop portions of the biscuit dough right onto the dish. I used an ice cream scoop, which created a fairly uniform look. When I am in a more casual mood, I simply use two spoons to scoop the mixture in a more haphazard way and that visual effect has its own charm. You can cook this cobbler in any ovenproof container that will hold about 2-quarts (2 L) in volume and that you feel comfortable presenting at the table, in case you want to serve family-style or from a buffet. I like using a ceramic dish, but ovenproof glass works, too. 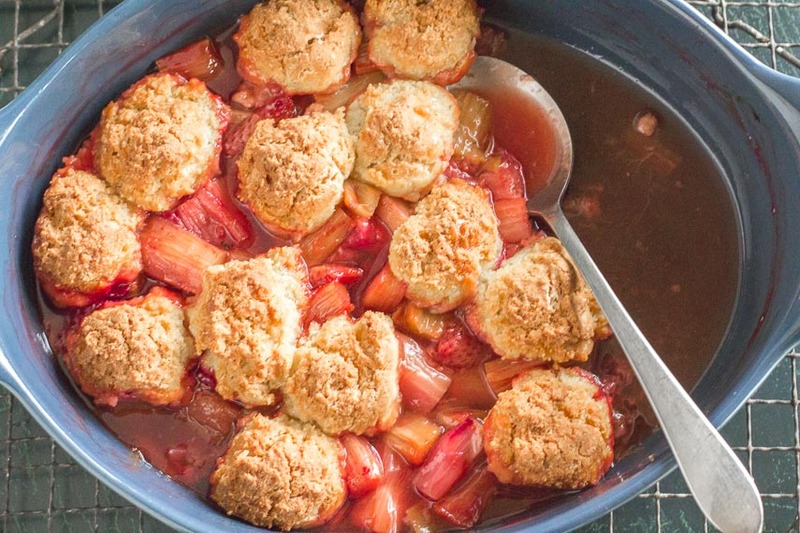 This strawberry rhubarb cobbler is very easy to make and we think it is best served warm, so plan ahead. Position rack in middle of oven. Preheat oven to 375°F/190°C. For the Filling: Toss the rhubarb, strawberries, sugar, cornstarch and salt together in a 2-quart (2 L) ovenproof decorative casserole; set aside. For the Cobbler Biscuits: Whisk the flour, cornmeal, sugar, baking powder and salt together in a mixing bowl to aerate and combine. Add butter and cut in with a hand-held pastry blender, two knives or your fingertips until the butter is cut into assorted very small uniform pieces. Add milk and egg and stir until evenly moistened. Dollop the biscuit batter on top of the fruit filling, allowing the fruit to peak out here and there. Bake for about 45 to 55 minutes or until filling is bubbling and the biscuits are golden brown.